We take seriously our responsibility to reduce instances of improper payments. 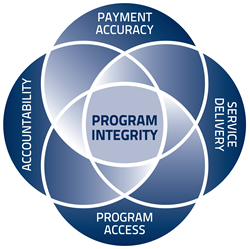 In fact, curbing improper payments is one objective in our current strategic goal to preserve the public's trust in our programs. Not all of our overpayments are improper payments, as unavoidable overpayments are not considered improper payments if statutes (laws), regulations, or court orders require us to make the payment. For example, the Social Security Act allows individuals, in prescribed circumstances, to request a continuation of their benefits while they appeal an adverse action. If the appeal is not decided in their favor, the resulting overpayment is not considered an improper payment because it was statutorily required at the point it was made. We have a number of strategies in place to protect the public’s tax dollars and ensure a more efficient and effective government. We conduct both medical and work continuing disability reviews (CDR) to determine if a beneficiary remains eligible, as well as Supplemental Security Income redeterminations to re-evaluate any nonmedical factors that would affect eligibility or the payment amount. In FY 2018, we completed approximately 896,500 full medical CDRs and approximately 2.91 million redeterminations. In addition, we completed approximately 314,400 work CDRs in FY 2018.